This Week in Books is a weekly round-up hosted by Lypsyy Lost & Found, about what I’ve been reading Now, Then & Next. A similar meme is run by Taking on a World of Words. I’ve read the opening chapters of The Stranger You Know by Jane Casey and am continuing to read The Golden Age of Murder by Martin Edwards. I’ve recently finished reading Harbour Street and Poirot and Me by David Suchet. I’ll be writing posts about these books soon. 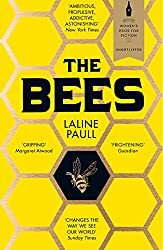 At the moment I think I’d like to read The Bees by Laline Paull next – a change from crime fiction. Laline Paull’s chilling yet ultimately triumphant novel creates a luminous world both alien and uncannily familiar. Thrilling and imaginative, ‘˜The Bees’ is the story of a heroine who, in the face of an increasingly desperate struggle for survival, changes her destiny and her world. ‘The Bees’ sounds interesting. I haven’t read a book with a non-human narrator for a long time. Happy reading! I’ve decided I want to read The Golden Age Of Murder. Will be interested in your experience with it. I love reading ‘different’ books. The Bees sounds great! Looking forward to hearing more about The Bees. That’s a real challenge for any author! The Bees book sounds interesting and we like the Vera tv show so I would like to read the Ann Cleeves book. The Edwards’ looks interesting. I must see if the library has a copy. I love Ann Cleaves. I’m yet to read that one though. Enjoy!